Peter Nyoni | Harare- The firing of former Zimbabwe’s Vice-President Joice Mujuru from both ZANU PF party and government by former President Robert Mugabe was characterised by two faces. Firstly, we have to look into the events that led to her appointment to the post ahead of Emmerson Dambudzo Mnangagwa (ED) of Lacoste faction. 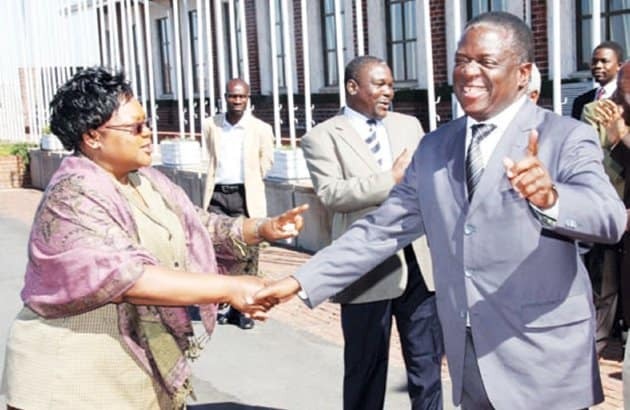 Despite the initial setback, ED remained calm, and never exhibited any hard feelings over the matter, because he understood the reason why Mujuru was appointed in his stead and, he knew the benefits, of the move to his long term plan. It is believed that Mujuru was elevated to the post by Mugabe in an attempt to appease her husband the late Retired General Solomon Mujuru, whom most of the current leaders were afraid of due to his military connections. This positioned him as a threat to both Mugabe himself, and anyone who would rule after Mugabe, in this case that is the current President, Mnangagwa. It was believed that Mugabe had promised Solomon Mujuru the VP post for helping him to lead the liberation struggle at the time when some regional leaders from the front line states (countries that supported liberation forces during war against imperialists), thought otherwise. Rumours had it then, that the later was now demanding that Mugabe should honour his promise, a scenario that would have dented most of the Mugabe administration’s political carriers, including Mnangagwa’s. So in order to silence Ltd Gen Mujuru from demanding the post, Mugabe appointed Mujuru’s wife, Joice, to the post of the VP, for the time being while devising a plan on how to deal with the late Rtd General once and for all. It was also later alleged that Rtd Gen Mujuru was planning to revolt against Mugabe for failing to keep up to his promise, and he helped in the establishment of the main opposition party in the country, the Movement for Democratic Change, by providing a roof for its initial meetings. After Rtd Gen Mujuru’s mysterious death, Mugabe and his cabal saw it now safe to demote or fire Joice Mujuru from the ruling party and government, under false and treasonous charges that she was planning to topple or kill Mugabe. Mujuru was never investigated or arrested for all these sins, the reason being that they were all fabricated probably by Team Lacoste, only to get her fired, and later her Gamatox faction members were also expelled from the ruling party. She was also accused of being corrupt. What boggles the mind was that if she was indeed fired because of corruption, it should have been followed by an investigation and arrest. Whilst on the other hand, if she was fired because of being a faction leader, ED who also led another faction should have faced the same fate too. It was a mind game well played, and, Mnangagwa won. 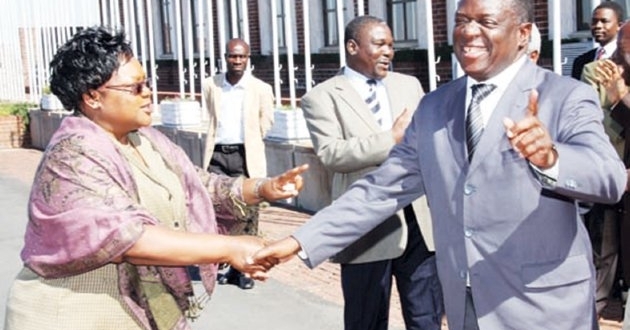 However, the ultimate coup leader, ED was over the moon when Mujuru was fired in 2014, even before he was promoted, not only because he was set to take over the post, but because it was also a further step forward towards his plan, the coup. He mesmerised delegates at the ZANU PF National Congress that year with his ‘pasi nemhandu-u-u’ (to hell with rebels) which he chanted in a mocking tone directed at Mujuru. ED was later appointed to the post, getting him closer to Mugabe, and making it easier for him to carry out his long mooted plan.